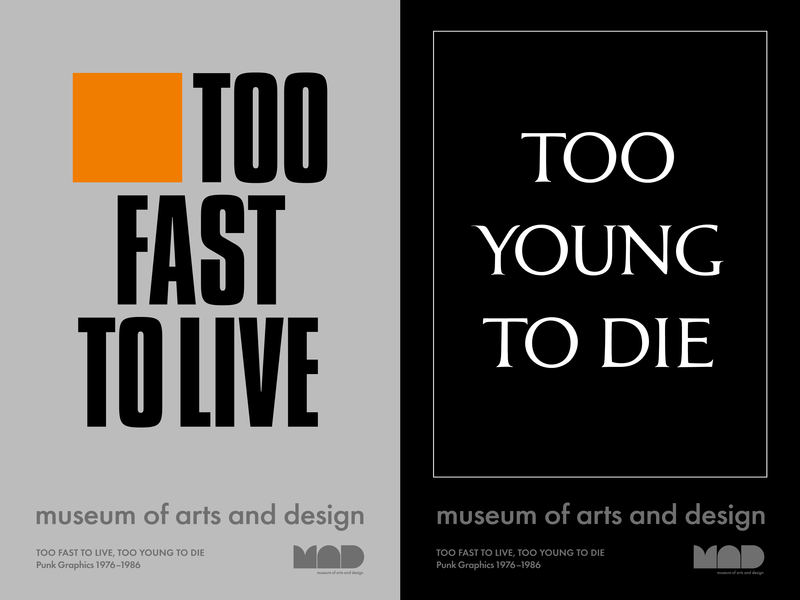 NEW YORK, March 7, 2019 /PRNewswire/ -- The Museum of Arts and Design (MAD) will present Too Fast to Live, Too Young to Die: Punk Graphics, 1976–1986, an exhibition that explores the punk and post-punk movements through the lens of graphic design. The exhibition, on view from April 9 through August 18, 2019, will feature more than four hundred of punk's most memorable graphics, including flyers, posters, album covers, promotions, zines, and other ephemera. Legendary graphic designers Malcolm Garrett and Peter Saville, both of whom have work represented in the exhibition, collaborated with MAD to create original promotional materials, including a subway poster campaign, a three-story banner for the Museum's facade, and merchandise for The Store at MAD. Garrett’s “Too Fast to Live” graphic—featuring bold black type on a metallic silver ground with a square pop of fluorescent orange—recalls his cover art for the Buzzcocks’ 1989 compilation album Product; while Saville’s “Too Young to Die” borrows its typographic treatment and high-contrast black-and-white colorway from his 1980 design for Joy Division’s Closer album cover. The Museum of Arts and Design (MAD) champions contemporary makers across creative fields and presents the work of artists, designers, and artisans who apply the highest level of ingenuity and skill. Since the Museum's founding in 1956 by philanthropist and visionary Aileen Osborn Webb, MAD has celebrated all facets of making and the creative processes by which materials are transformed, from traditional techniques to cutting-edge technologies. Today, the Museum's curatorial program builds upon a rich history of exhibitions that emphasize a cross-disciplinary approach to art and design, and reveals the workmanship behind the objects and environments that shape our everyday lives. MAD provides an international platform for practitioners who are influencing the direction of cultural production and driving twenty-first-century innovation, and fosters a participatory setting for visitors to have direct encounters with skilled making and compelling works of art and design. For more information, visit madmuseum.org.